Limited Run Games and Zeboyd Games have announced that Cosmic Star Heroine will arrive on Nintendo Switch next month. The game takes inspiration from the classic 16-bit era, but mixes things up by adding features seen in more modern RPGs. There are three exotic planets to explore containing aliens, robots, and magic, and you'll be playing as the brave heroine who must fight against conspiracies and a galactic threat to make things right. 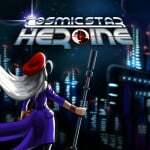 Cosmic Star Heroine was originally released on other platforms last year, generating "very positive" reviews on Steam, so it could well be a very welcome addition to the Switch's library. If you're interested, you can check out the game's full feature list below. - 2D visual style straight from the height of gaming's 16-bit era! The game will be released on 14th August and is currently available to pre-order from the North American Switch eShop for $13.49. I played this on the PS4 and enjoyed it quite a bit. I’d say it’s worth checking out if you’re into old school JRPGs. I highly recommend this game. Reminds you of Mega Drive Phantasy Star games. I have already multiple versions of it so I won't get it again though. Forgot about this game, never ended up getting it in the ps4. May be a perfect time to check it out. Happy to see it coming! Already played and it was not bad at all ! So I pass then ! Well done them and I will be showing my support with a physical release! The above says "Limited Run Games" this better mean a physical. If so when can I pre-order! As others have already mentioned, this game rocks. It's a great tribute to old games but still manages to have it's own unique identity. Definitely looking forward to this one. Everything I've heard about it sounds great. On the wishlist it goes. I am quite intrigued. It will depend if Octopath Traveller completely takes over my life, like I expect it might, but this game really does look interesting. This reminds me a lot of Septerra Core. Anyone here who remembers that game as fondly as me? I don't get the title of the game, why call it Cosmic Star Heroine when there's a few male characters in the group not to mention why only credit that one nobody when there's a bunch of somebodies in there as well? Alyssa is the main protagonist. Why wouldn't they name the game after her? @VigilThief Nah I just feel like I was dupe with the title, I was expecting to see one main character and instead the game throw in three more. Should had called it Cosmic Star Heroes unless those other characters play no importance in the game that much. @VigilThief I used to find excuses to go home over lunch breaks to play Septerra Core, and then stay there for 3hours, hoping no one noticed. I got so hooked on that game. That they never made a sequel is tragic, that ending was a blow to the gut. and yes - definitely reminds me of it. It was kind of fun in short bursts. Since I have it for PS4 and Vita, definitely probably won't double dip...on the other hand, I never did get around to beating it and I like all the games I enjoy being 'unified' on Switch...hmm. So nice to meet a fellow fan of Septerra Core. We're a rare breed. Looks like a cross-over of Phantasy Star 4 and Chrono Trigger. Never heard of it but def. will buy asap. Looks nice. I'll get this if the price is right. What an ugly game. So many indie games hide poor art behind low resolutions and fake nostalgia. The likes of Capcom, Konami, or Square would never have put out anything as ugly back in the day. There are few studios capable of high quality low resolution art anymore, but one which is, is d-pad studio (Owlboy). The team behind Sonic Mania also know their way around chunky pixels. This looks amazing. I love it for the Phantasy Star influence. I just wish Sega would make a PS5 game. I will settle for nostalgia. I need a review first, but I am impressed. I will be definitely keeping my eye on this one. This looks great. Will have a look after Octopath is done. wow, never knew about this title. HyperDuck SoundWorks is great, love the 'beyond-future chrono trigger' look and feel. will wait for the physical. Looks good. Will give it a go. Looks interesting, but my backlog is super real right now. I'm more likely to pick this up once i get my backlog down if i happen to see it on sale and remember oh that looked alright might add it to my wishlist. Last "pixel art" game I played on PS4. I really liked it... Worth the price and some! Also have it for the VITA (well if you got it on PS4 you got the vita one for free) And it plays great on the small screen - good game for on the go. People should check it out. Why am I getting MAJOR Chrono Trigger vibes from this? I've been looking forward to this for awhile. The developer's previous games were all good takes on the old-school JRPG: Cthullhu Saves the World, Breath of Death VII, Penny Arcade 3 & 4 (the ones that played like Grandia). Got it on Ps4 day one and didn’t like the game. All those exclamation points in the game details really got me firing on all cylinders. .... no seriously it does sound good! Going to be real tough to stay focused on it though with Octopath going practically side-by-side with it.